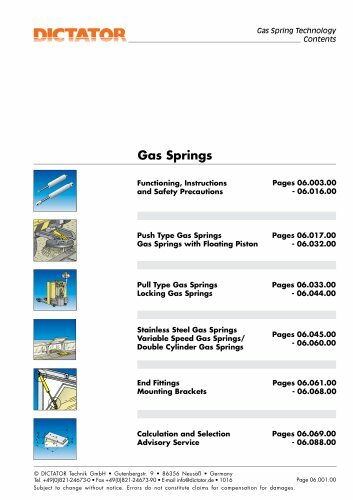 Gas Spring Technology _Contents Functioning, Instructions Pages 06.003.00 Push Type Gas Springs Pages 06.017.00 Gas Springs with Floating Piston - 06.032.00 Pull Type Gas Springs Pages 06. 033.0 0 Stainless Steel Gas Springs Variable Speed Gas Springs/ Double Cylinder Gas Springs Calculation and Selection Pages 06.069.00 © DICTATOR Technik GmbH • Gutenbergstr. 9 • 86356 NeusaB • Germany Tel. +49(0)821-24673-0 • Fax +49(0)821-24673-90 • E-mail info@dictator.de • 1016 Page 06.001.00 Subject to change without notice. Errors do not constitute claims for compensation for damages. State 01/2016 © DICTATOR Technik GmbH • Gutenbergstr. 9 • 86356 NeusaB • Germany Page 06.002.00 Tel. +49(0)821-24673-0 • Fax +49(0)821-24673-90 • E-mail info@dictator.de • 1016 Subject to change without notice. Errors do not constitute claims for compensation for damages.